The magical fairy tale by Hans Christian Andersen that inspired Disney’s Frozen springs to life in this World Premiere ballet! When Gerda’s best friend Kai disappears she sets off on an epic journey to save his life. But can Gerda’s belief in their friendship break the Snow Queen’s enchantment before it’s too late? This timeless story is told through the art of dance and continues our popular performance collaboration with Escalate Dance that brought you Owl Moon, The Mitten and Twelve Dancing Princesses. Stages Theatre Company would like to dedicate this production to Jill Harper and her family. Performances run MARCH 4 – MARCH 20, 2016. Click buy tickets above to see performance schedule. This production also features thrilling and beautiful aerial work on silk fabric that will leave you mystified. Halle Audette (Dance Ensemble / Understudy Gerda) Halle is appearing in her fifth production with Stages Theatre Company. She has previously appeared in Owl Moon, The Mitten, Twelve Dancing Princesses, and A Charlie Brown Christmas. Halle has also appeared in productions with Cross Community Players. She is 12 years old and in the 6th grade at Anoka Middle School for the Arts. Special thanks to Sherry Dease, Halle’s first dance teacher, for starting her off on this journey with a strong foundation and great love for dance. Grace Blando (Dance Ensemble) We are excited to have Grace making her Stages Theatre Company debut. She has also appeared in productions with Open Window Theatre. Grace is 17 years old and in the 11th grade. Grace’s passion is ballet, and she has been blessed with talented and supportive teachers. Last summer, Grace studied at the Joffrey Ballet School in NYC. Special thanks to Dixie Rairamo, Kirsten Iiams, and Marius Andaházy. Zoe Carter (Dance Ensemble) Zoe is back at Stages Theatre Company for her third production, having previously appeared in Owl Moon and The Mitten. She has also appeared in productions with Morris Park Players, Cross Community Players, and Maple Grove Middle School. Zoe is 12 years old and in the 6th grade at Maple Grove Middle School. When Zoe is not on stage, she can usually be found with her nose in a good book, hanging out with her friends, or riding her bike to the library. She’d like to thank her parents for driving her around to both dance and rehearsals, and to Ann Marie and Sandy for giving her this opportunity. Arie Cohen (Kai) We are excited to have Arie in his Stages Theatre Company debut. He has also appeared in productions with Eden Prairie Players, Chaska Valley Family Theatre, Morris Park Players, Artistry, and Cross Community Players. Arie is 12 years old and in the 6th grade at Eagle Ridge Academy. Arie enjoys dance (ballet, lyrical, tap and clogging) and with Arie, no ones needs a radio, as he is always singing beautiful tunes. He would like to thank his parents, sister, dance teachers, and his school for enabling him to be part of this production. Liliana Felton (Dance Ensemble) Liliana is appearing in her sixth production with Stages Theatre Company. She previously appeared in Little Mermaid Jr., The Mitten, The Wiz, James and the Giant Peach, and Twelve Dancing Princesses. Liliana has also appeared in productions with FAIR School, SteppingStone Theatre, and Children’s Theatre Company. Liliana is grateful to the staff at Stages and her family for allowing her to be a part of this fantastic show. When not on stage, she enjoys spending time with family and friends. Read the book THE SNOW QUEEN by Hans Christian Andersen. 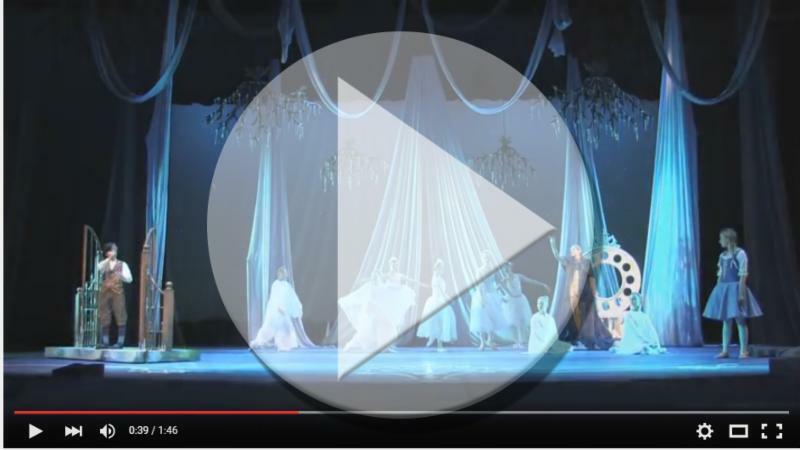 Learn more about ESCALATE DANCE, our partner in this production.